ment, rather than on fundraising. Nwish Federation (left) and Arnold Rosenthal. annual Scholarship Ball held last spring. why and are asked properly." "Stop the Jew Food Tax,"
"Death To All Zionist Jews"
saw the bomb on a ledge,"
fell in World War II." during the early morning hours when the quake struck. estimated between 3,000 and 5,000.
buried in the rubble of buildings blasted by terrorist bombs. democratic nations with respect to the Middle East. number for 1985 is 68.
year to the Jews in Poland. put into action next yea? The help that the Memory! something so tiny mad* it so big. are packed with Bny little tea loaves 8ecauae tiny is tastier! *d to our Federation . pus here later in the day." would require a rabbi on its staff. with any synagogue or temple. ed on his visits and comforting . -een 25 and 30 percent. 17 percent to 15 percent. would only speed up inflation. could not be trimmed any more. barn" in Morrisville, Vermont this summer. (Note the "Shalom"
MMrfcct far tarvfaw many ** r*** udiwidilhhdmtmi. 1 (12 MKIlMcUft **MM*l (Id. Mtotti witk FUISCMUM S Umimhm Stir ..
Fleisdimannk gives every meal a holiday flavor. d.l,Wy Mk. thk mot. o.d.i pivaht. lo MK.to.1 C Fin. country where they were needed. student rebellion in the country. more morality in German society. who didn't think of responsibility. "People who were in the S.S.
million Jews who were killed. Most didn't confess any guilt." Russians at the end of the war. was involved in the Holocaust. result, they only teach the facts. you look like a Jew." assignment is the Delray Hospital. are afflicted in body and spirit. a result of these experiences. of what fellow Jews must! terest in the Holocaust was again population of South County. pened untii that movie was shown. plain what Germany had done. taught enough about the subject. Out ol Town Upon ReoaiSSt. were absent a difficult time. those doing the negotiating (viz. that staying away from school on. religious holydays not tven I*"
Ijcted hy the Nazi regime. tively engaged in this mission. pients of pensions alive today. Fund up to 400 million Marks. restitution, and great leaders answered. in countries other than Germany. decades of its existence was Dr.
to the victims of Nazi persecution. pains of Jewish Holidays . days, from Oct. 14 through Nov.
course will be held Mondays, Oct.
Nov. 21 (Thursdays), at 7:30 p.m.
Ceramics Class on Mondays, Oct.
with Diane Marcovitz, as teacher. Speaker on Tuesday, Oct. 15 at 7:30 p.m. The classes will be held on Wednesdays, beginning Oct.
16 and ending Nov. 20, from 7-8:30 p.m.
non-members will be charged a nominal fee of $3. for non-JCC members. The Registration Deadline is Oct.
through Nov. 12. from 2-4 p.m.
ticipate. Coat for members $20. starting Oct. 22 through Dec. 3.
for registration is Oct. 14.
p.m. Cost for members is $20. day, Oct. 18, at the Center. will be tallied and prizes awarded. game. Class will be held Mondays. a.m.-12 noon or from 7-9 p.m.
que program for older drivers. Oct. 23, from 9:30 a.m. to 1 p.m.
deadline is Monday, Oct. 14.
your own in Coconut Grove. gress is to be avoided. member Rabbi Meir Kahane from making his view heard. Kahane's invitation to attend but we won't let him be heard." folk-Wee ballads, dixieland and trodttlonal. to provide a unique recreational setting for Jerusalemites. the situation of Soviet Jews. agreed to assist on that issue. Israel and Egypt over Taba. She has appeared in the U.S.
purchase is a season's ticket . margarine in a heavy casserole. J* As the cubes br? p, the West Bank and Gaza. I'd against attack by us." with Israel in Cairo over Taba. Publix Bakeriet open at 8:00 A.M.
Now the challenge truly begins. side that said "maybe 'me too." the Cantor's chant of Kol Nidre. Hashanna is closer than we think. It is time to make them real! U.S. and to Manchester, England. between Miami and Tel Aviv. Temple Sinai Sisterhood Board meeting, 9 a.m.
Women Boca Board meeting, 10 a.m.
meeting, 10 a.m. Hadassah Boca Maariv meeting, 12:30 p.m.
B'nai Torah Sisterhood meeting, 7:30 p.m.
National Council Jewish Women South Point meeting, 9:30 a.m.
Pioneer Woatn Kiaaeret Board meeting, 12:30 p.m.
Temple Beth Shalom Board meeting, 10 am. the area for nearly two hours. leader (Yasir) Arafat," he said. dent, Joseph Boumans. Services held at the Levis JCC, 336 X"
vative. Phone 495-0466 and 495-1300. Cantor I^nMeJnj. Phone: 391-8900. Rabbi Merle E. Singer Af'^V^,! ). Box 340015. Boca Raton..
Daily Minyana at 8:45 a.m. and 5 p.m. IT Union director of U.S.
ic A ve., Delray . wishes for a successful year. meeting, Sunday, Oct. 13,10 a.m.
tional opera singer Dario Cassini. tion, call 922-1144 or 945-9696.
fs of Temple Beth El. * Blvd. N.W.. Boca Raton. Fla.
P" N.E. 6 Street. Miami, Fla.
K Shochet, 120 N.E. 6 Sreet. N E 6 Street, Miami, Fla.
'Pn in this order: average no. rent to filing date: A) total no. i ..ther free copies 170, 1,079. Boca Raton young couples club. of hor d'oeuvres and desserts. ner and Auction on Saturday. 499-1234 or Jackie Kalb 499-1791. Shalom, W. Atlantic Ave., Delray. first topic will be "Loneliness"
on Tuesday, Oct. 15, 10:30 a.m.
ple's Social Hall, Sunday, Oct. 12. Oct. 13, 9:30 a.m. at the Temple. Their guest speaker will be Rose. vice, Saturday, Oct. 12, 8:45 a.m.
Shabbat, Friday, Oct. 18, 10 p.m.
9:30 a.m. at the Temple, 7099 W.
Japan and the Japanese people. Industry and the larger department stores. prices and halting the inflationary spiral. -Serving all Jewish cemeteries in South Florida. 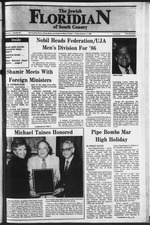 Press, 1985. 231 pp., $15.95. ings of the characters in the novel. degree, the novel has succeeded. Beach hotel room where Dr.
before Hitler came to power. Germany in the early 1930's. World War I. He is cured of his at"
to him, "Goodbye Karl Erich,"
Erich is the central emphasis. wife, mother, artist and designer. about her daughter and two sons. and her two sons in Israel. breakfast areas, spacious living and dining areas.